This complimentary eBook highlights how Atlassian teams use JIRA Software, JIRA Service Desk, Confluence, and HipChat every day to enhance service management across IT, HR, Legal, and of course Customer Service. 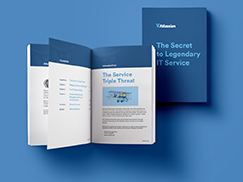 Explore how Atlassian tools can help your team provide legendary service. This eBook is a great read with some great insights, plus it's free so why not download it?